For Whedonites, 'Much Ado About Nothing: A Film By Joss Whedon' is a journey behind the scenes of a quiet classic, for Shakespearians here is yet another way in which the immortal’s work remains so. 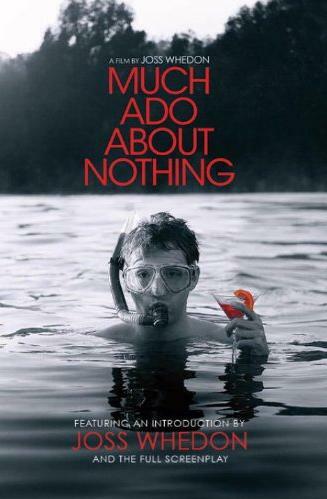 There are two personalities at work in Much Ado About Nothing: A Film By Joss Whedon from Titan Books, the companion book to the film of the same name: one a writer who never speaks and one a speaker who rarely writes. As with the film, the book is tied together in how both personalities communicate through the same material, with Shakespeare providing the words that Whedon never could, and Whedon providing the context Shakespeare never did. While the new material contributed to the volume is limited to a 3-page introduction by Joss Whedon and a 20-page interview with him, there is a surprising amount of information conveyed. The interview is especially revealing not only of the details behind the film – many of which illustrate just how much time and effort was placed into what feels like a breezy and surprisingly well-crafted vanity project done by a director with more new-found wealth than he’d ever imagined and a bunch of his actor friends during their days off from more glamorous and lucrative day jobs – but also into Whedon’s personal narrative and the impressive depth remaining in a 400-year-old play. Exponentially more has been written about Shakespeare than has been written by Shakespeare, yet the approach which Whedon lays out in his introduction and interview make it clear that even as hundreds of permeations of Shakespeare have been staged, there remain thousands more which future artists may apply to the Bard’s words. Whedon outlines his own approach through numerous, entertaining anecdotes. For literature or theatre geeks, Whedon’s stories of Sunday night script readings with his troupe of thespians will provoke delightful memories of late night impromptu sessions, while anyone else can easily imagine how cool it would be to spend an evening around a dozen of cult favorites being silly with Shakespeare, seeing the roots of Amy Acker and Alexis Denisof’s wicked on-screen chemistry and hearing Whedon himself try on different accents. Stories of Nathan Fillion’s reluctance in tackling Shakespeare and Tom Lenk’s unfamiliarity with police roles are both amusing and humanizing, showing art (or “aaaaht” in a snooty, overly-breathed accent) as a living dialogue rather than a stagnant monolith. Whedon’s screen adaptation takes up the vast majority of the book, divided by sections of photographs from the set of Whedon’s home. The play is basically the same from that which has appeared in theatres and high school auditoriums for centuries, but abbreviated, formatted and with stage directions unique to Whedon’s production. Through this we see how a thoroughly modern director crafted a Reformation-era text for his own sensibilities. Although readers of Shakespeare will be familiar with the words, there remain new discoveries within the context surrounding those words. Those unfamiliar with the play may appreciate seeing the rhythms and wordplay so prevalent in Shakespeare’s work and perhaps decide to read more. The three dozen or so pictures sectioned into the text are a nice bonus as more Amy Acker is always a good thing. Much Ado About Nothing: A Film by Joss Whedon isn’t groundbreaking, but fans of either personality on display will definitely find something worth holding onto. For Whedonites it’s a journey behind the scenes of a quiet classic, for Shakespearians here is yet another way in which the immortal’s work remains so.